With the arrival of Mozzarella cheese in our store it seemed right to share one of the simpliest and tastiest salad from the mediterranean tradition. 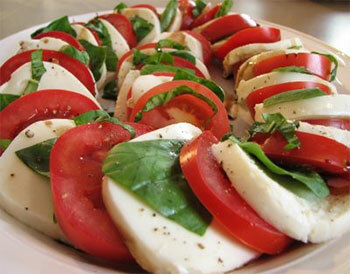 I am talking about the famous Caprese Salad (or Insalata Caprese like we say in Italy). In this biref article I'd like to tell you not only how to prepare this Italian dish but also share its history and some facts about it. Open the Mozzarella bags and drain the water. Cut the 2 Mozzarellas in slices of about 1cm each. Wash poperly and cut the tomatoes in slices of the same size. In 2 plates lay one slice of Mozzarella and a slice of tomato and repeat this steps untill you finish both of this ingredients. Now add a bit a salt, the oregano (or basil) and complete with the olive oil. The right way is to add the olive oil at the end as it will spread the salt and aroma of the oregano with it. If you're going to put the oil first it will give an impermeable layer on the Mozzarella and the tomatoes thus will deliver less taste. There you have it, Good appetite! ... and if you need a good wine to go with your salad, let me suggest you a Pinot Grigio Garda DOC.